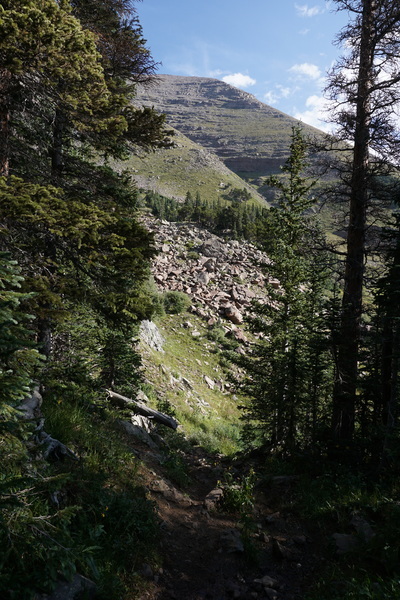 Directions: From Westcliffe head south on Hwy 69 and turn right onto 119 (Colfax) following signs to the South Colony Trailhead. 119 is a good dirt road. At the T intersection turn right onto 120 (South Colony Road) at a sign pointing right to South Colony Lakes Trailhead, left to Music Pass Trailhead. Follow South Colony Road to the lower trailhead and the start of the 4WD road. 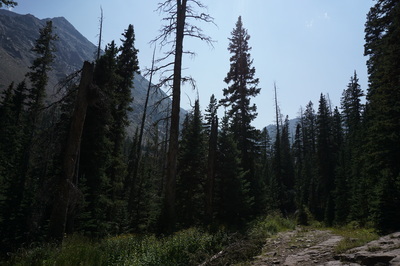 As of August 2015 the road has been improved and graded. 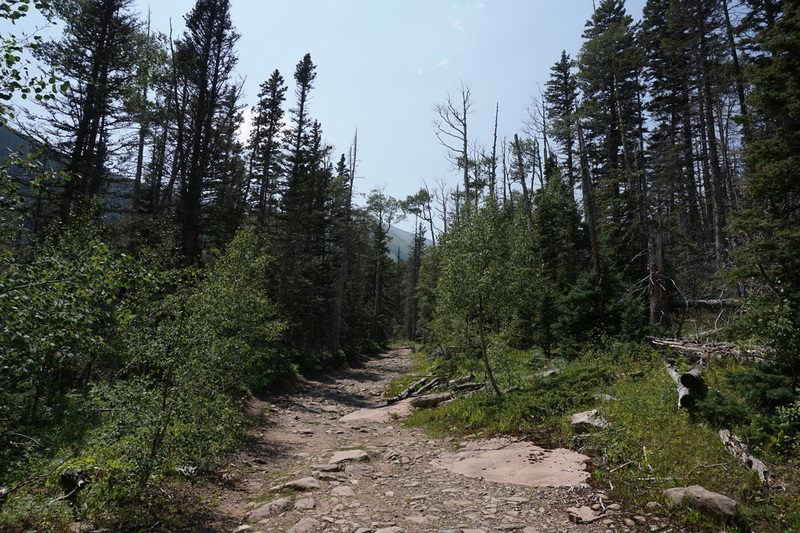 Still, it is a serious road and you should not attempt it in a 2wd sedan. You need good clearance for this road and check with the Forest Service for current conditions. 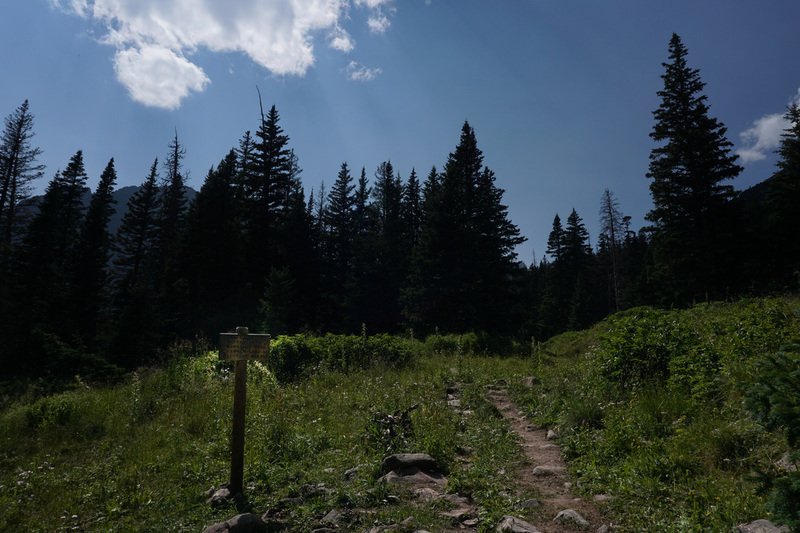 Follow the road for 2.5 miles to the upper trailhead and parking. 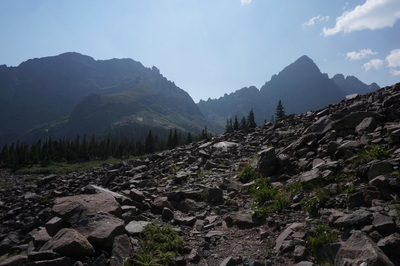 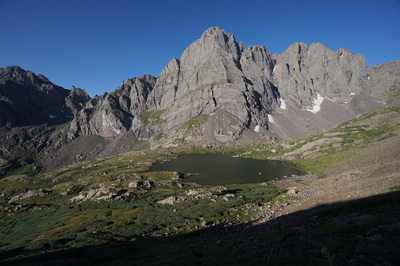 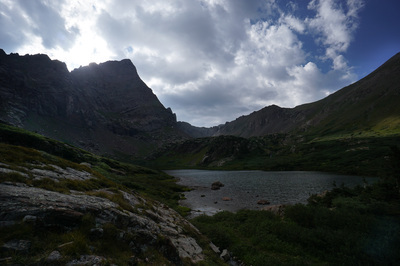 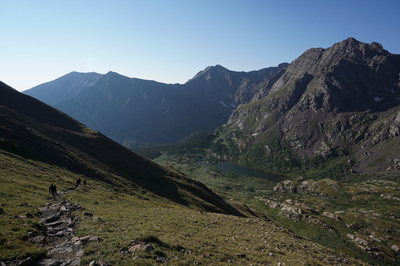 The hike up to Humboldt Peak from the South Colony Lakes is extraordinary. 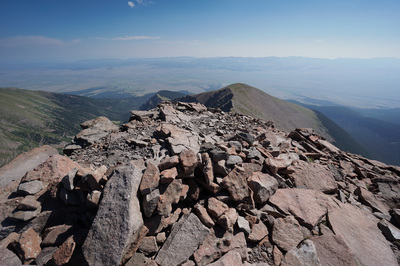 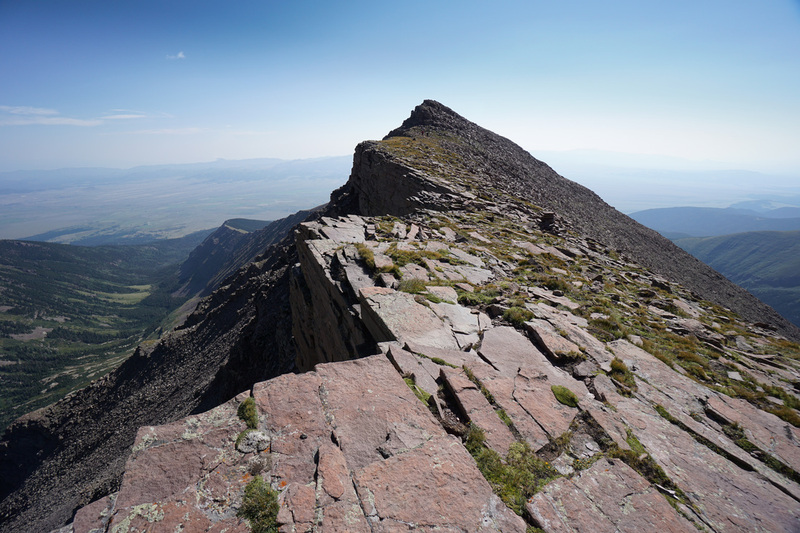 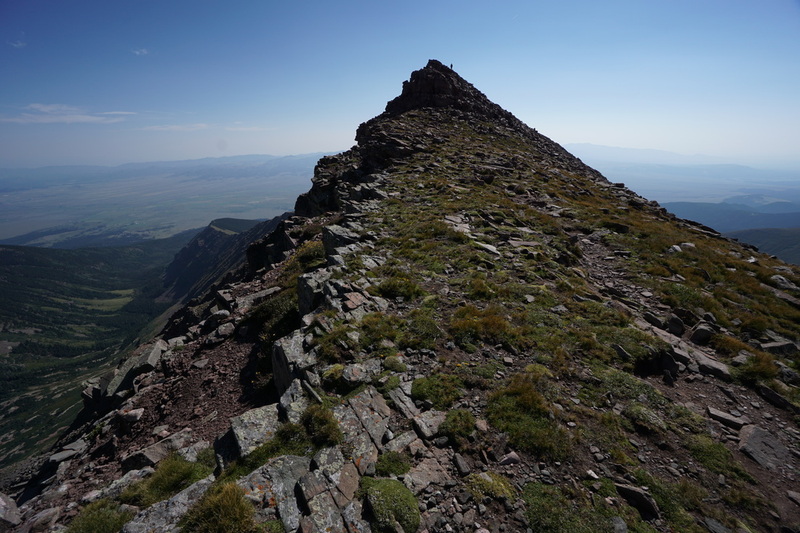 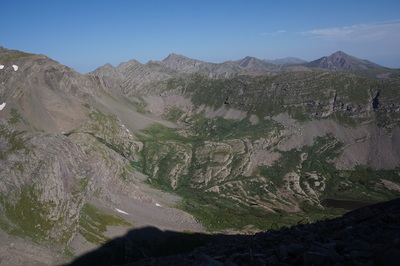 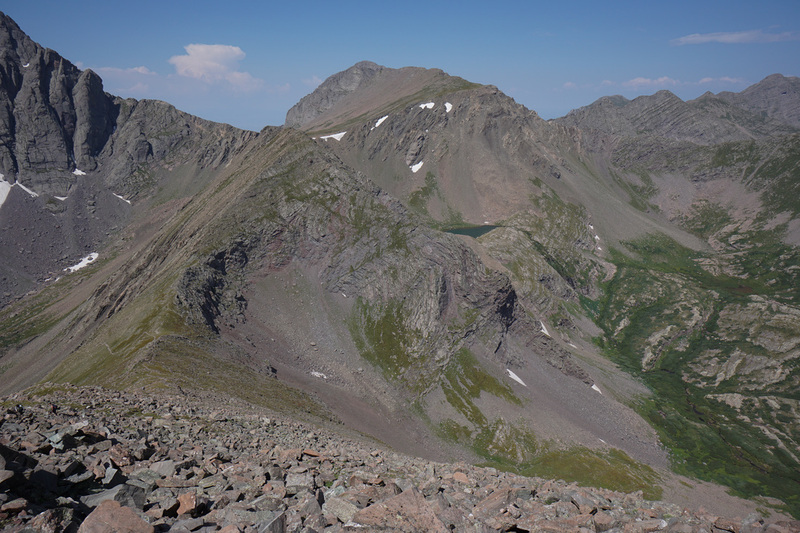 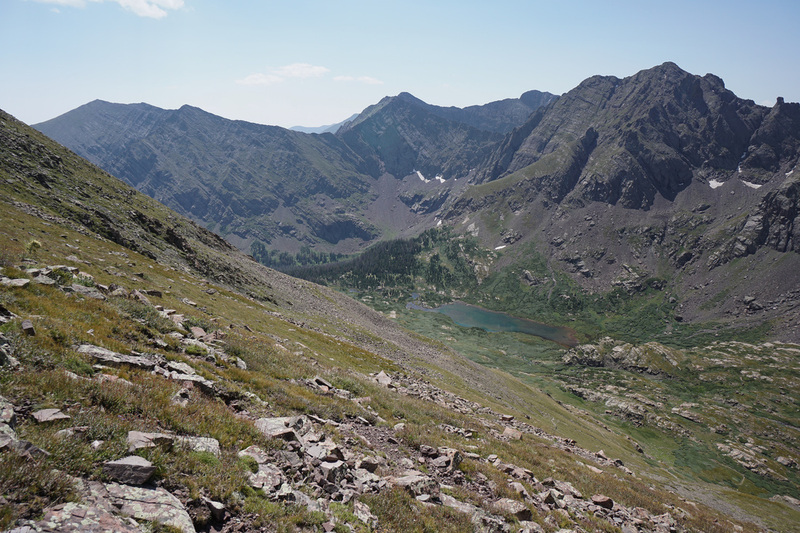 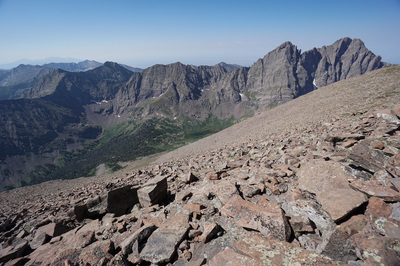 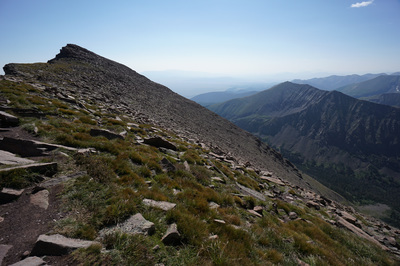 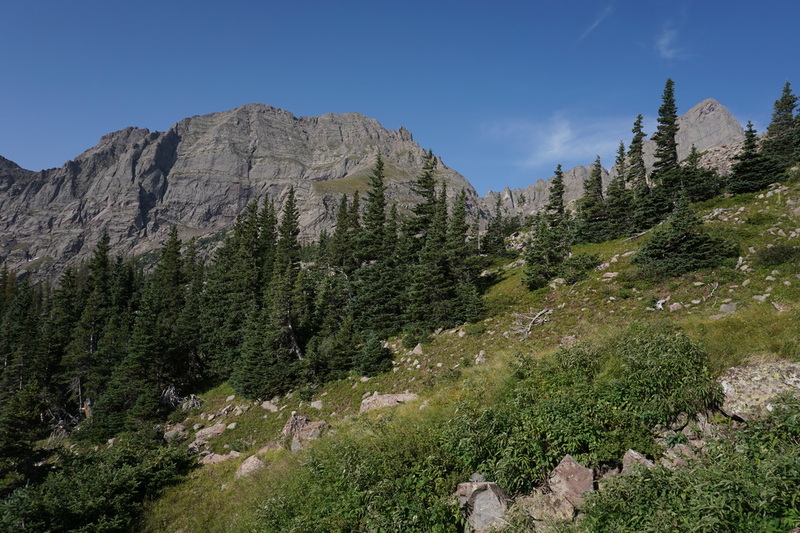 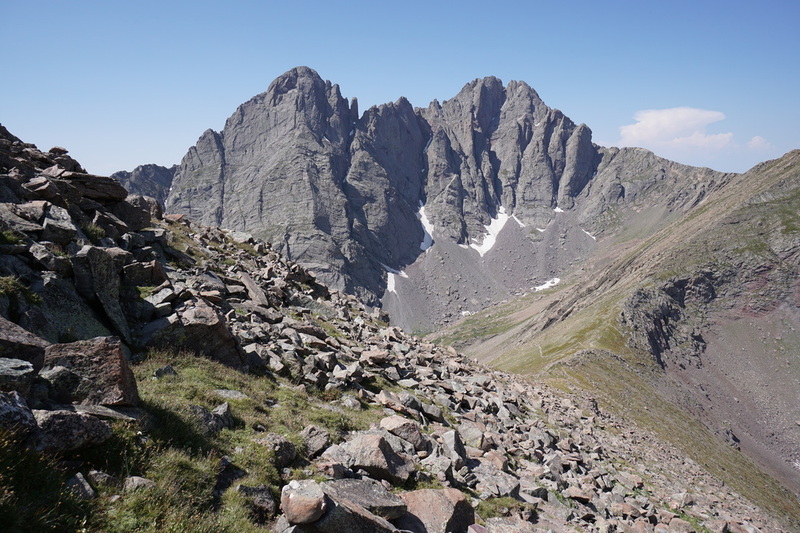 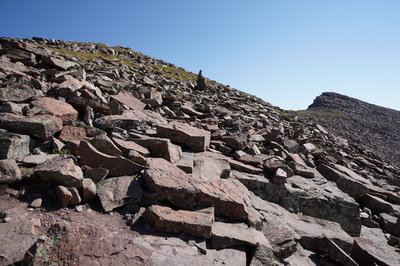 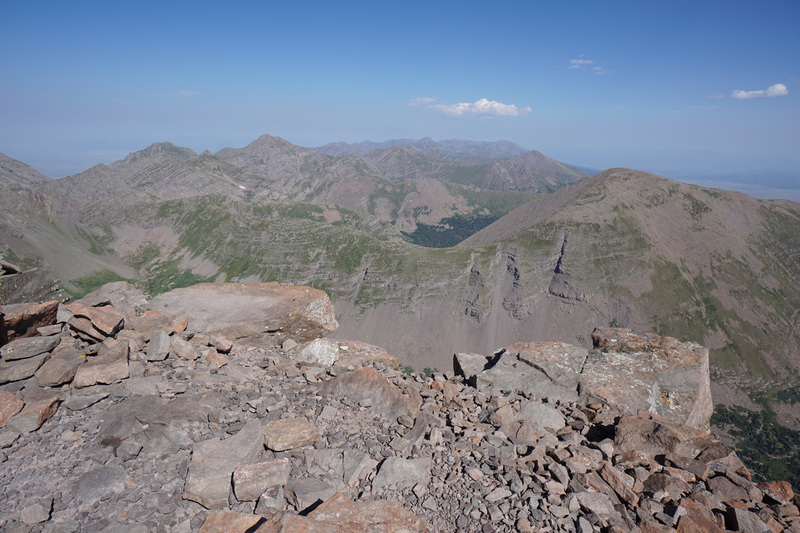 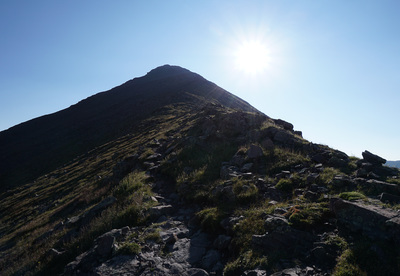 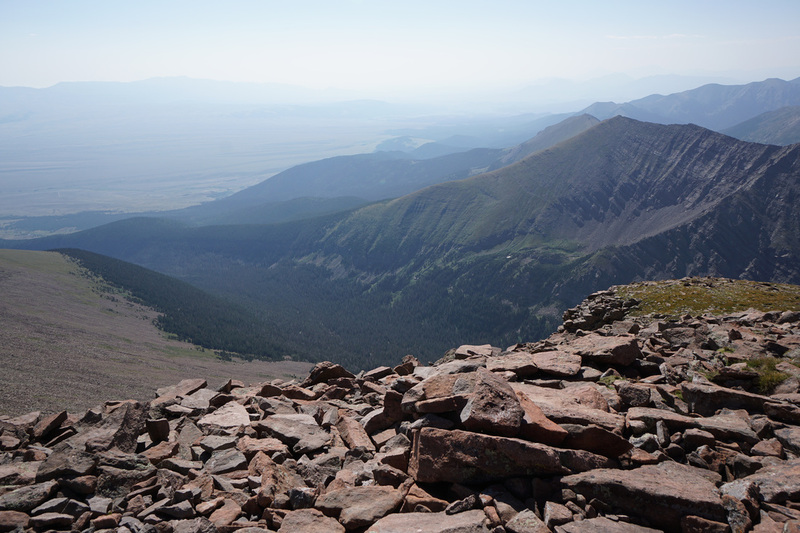 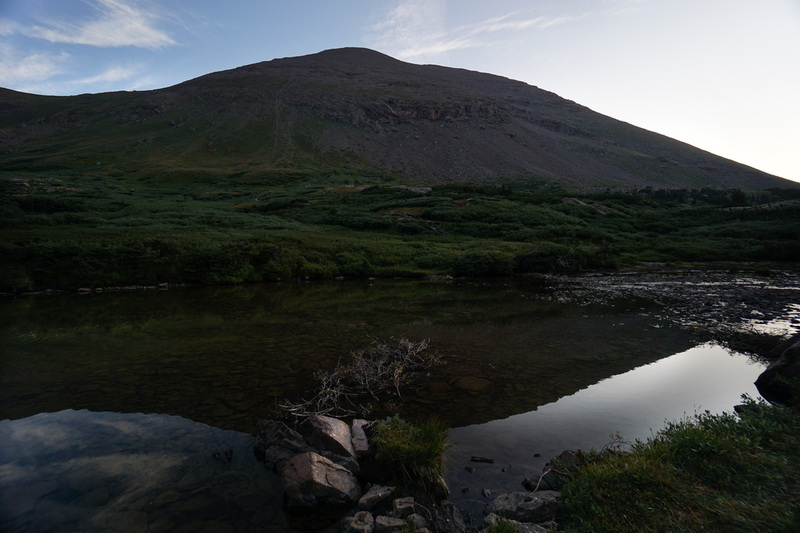 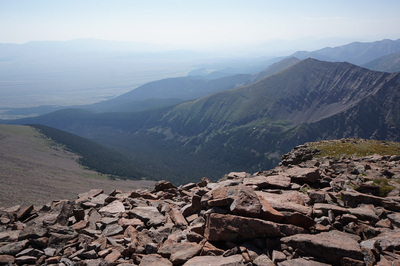 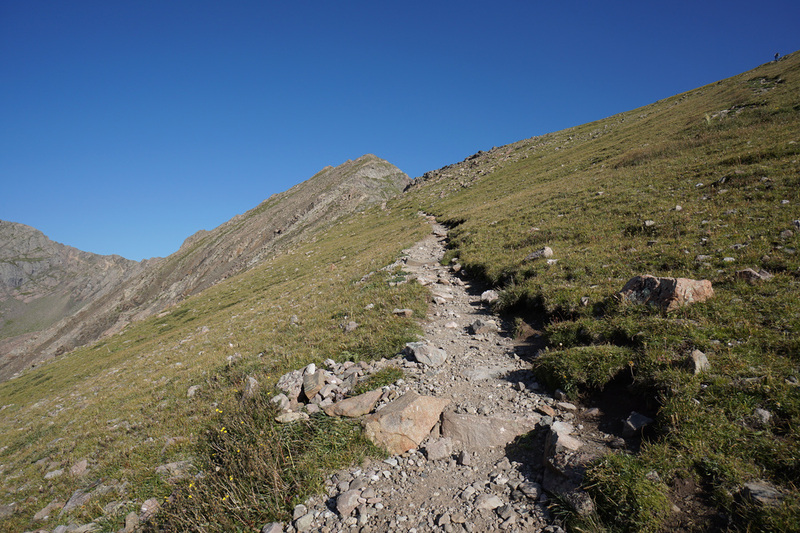 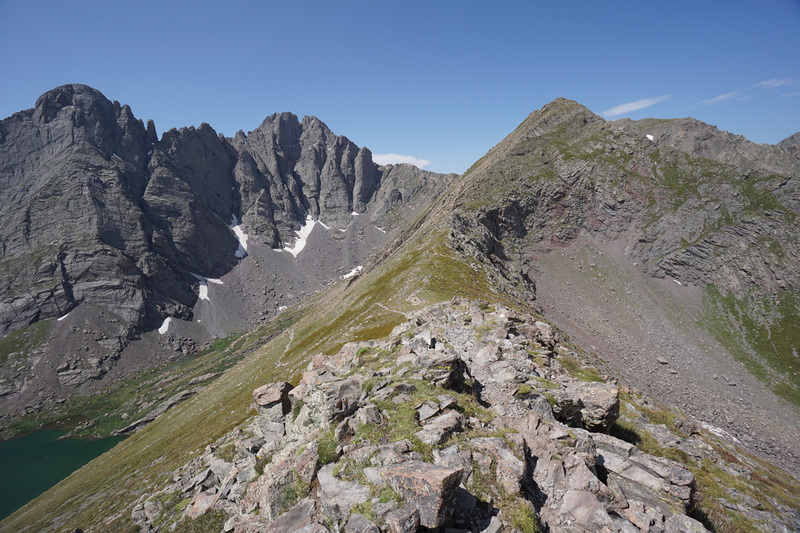 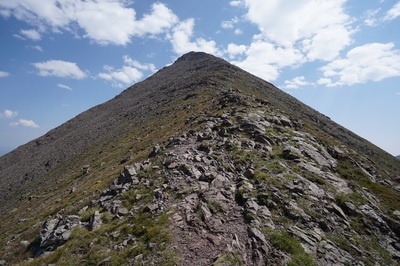 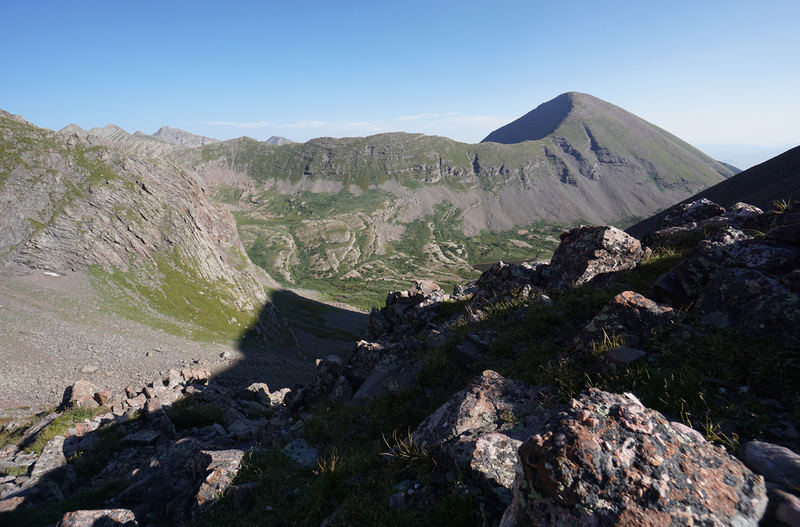 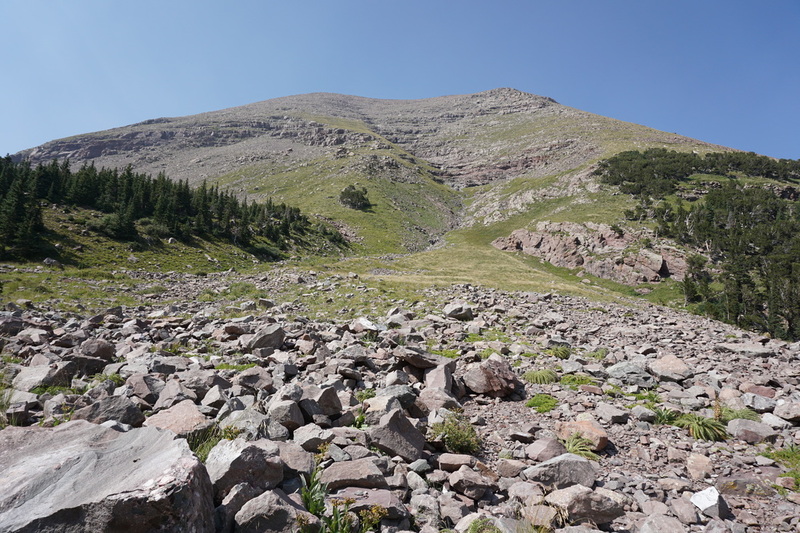 While the peak is probably the easiest Sangre De Cristo 14er, it is not easy. 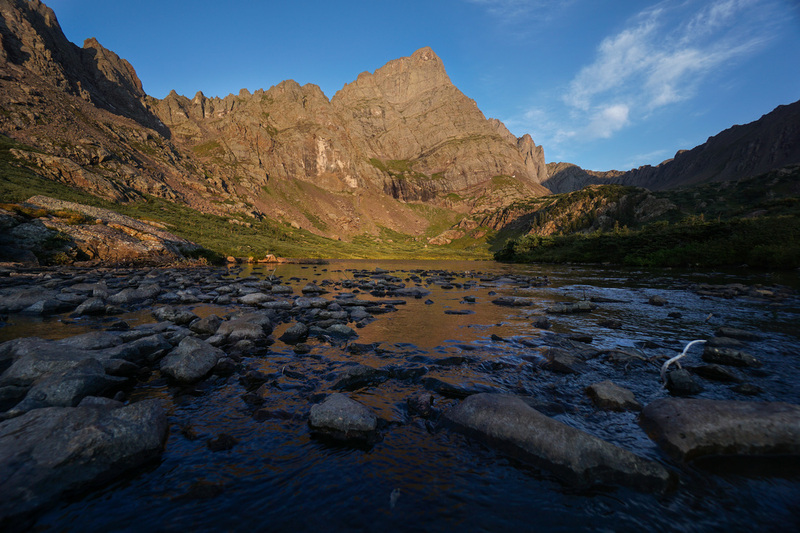 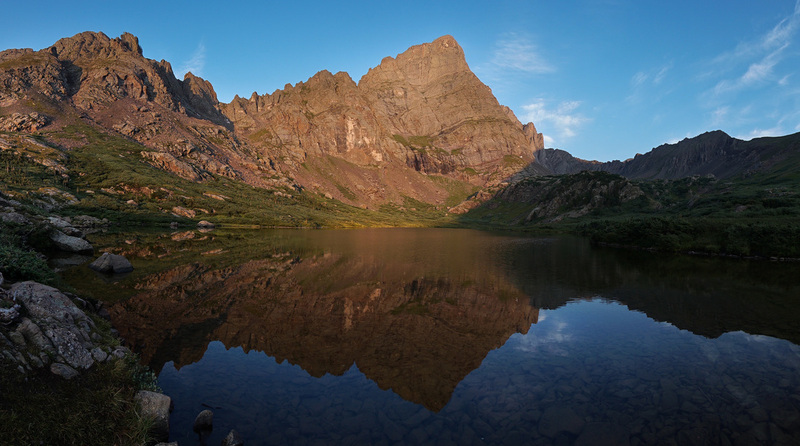 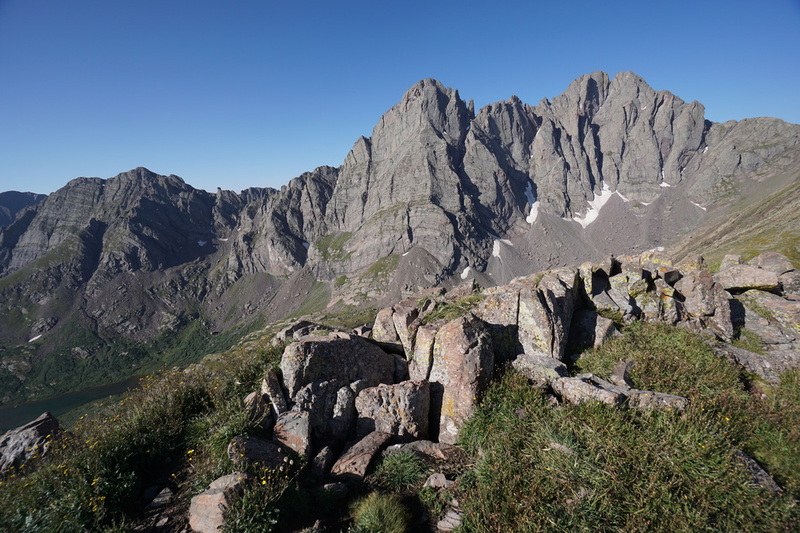 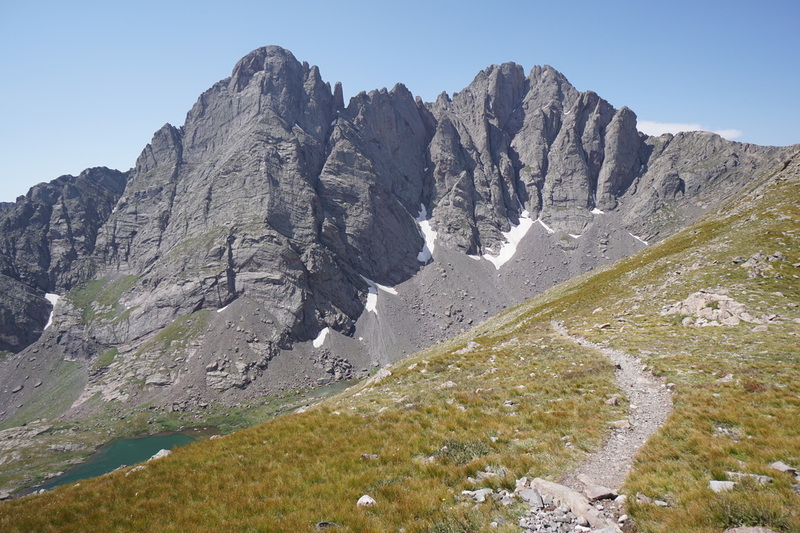 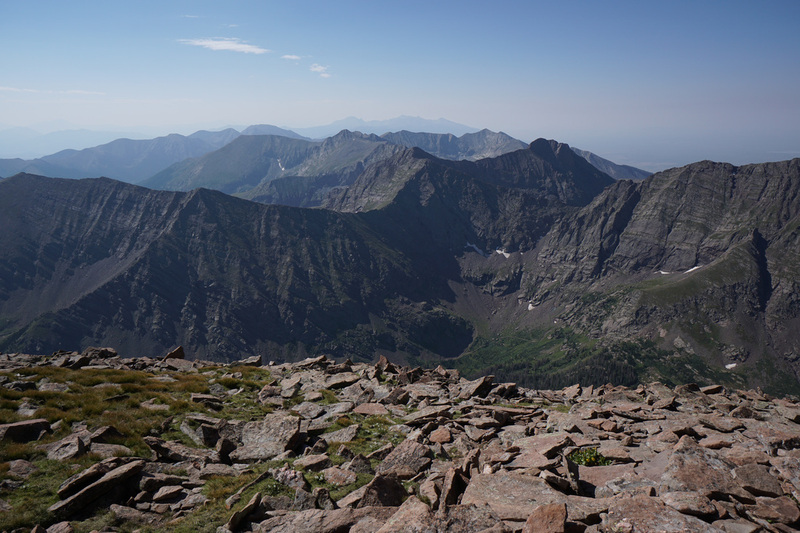 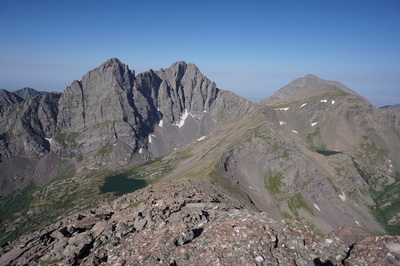 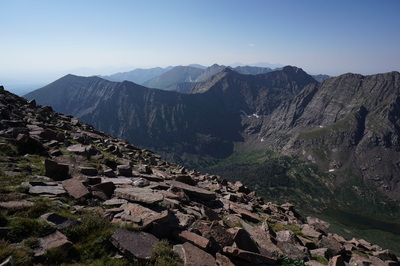 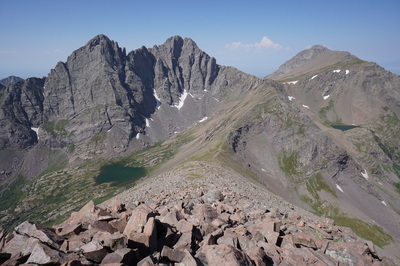 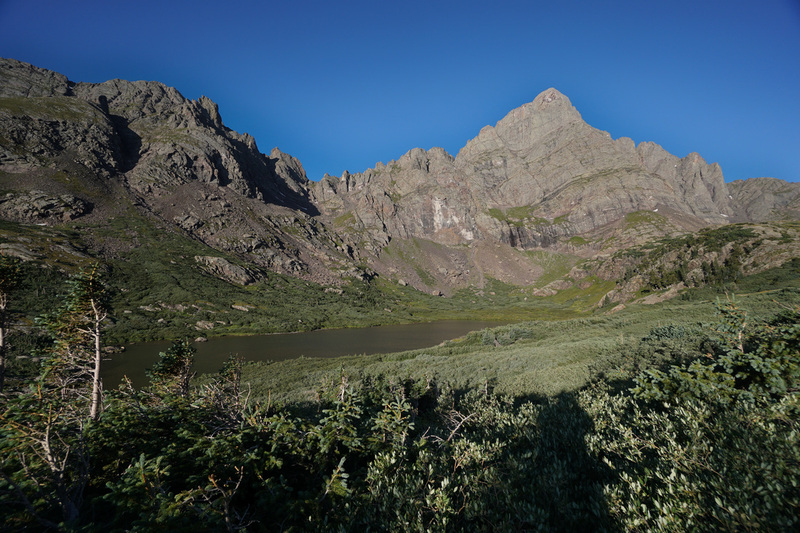 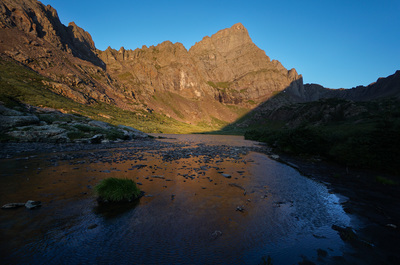 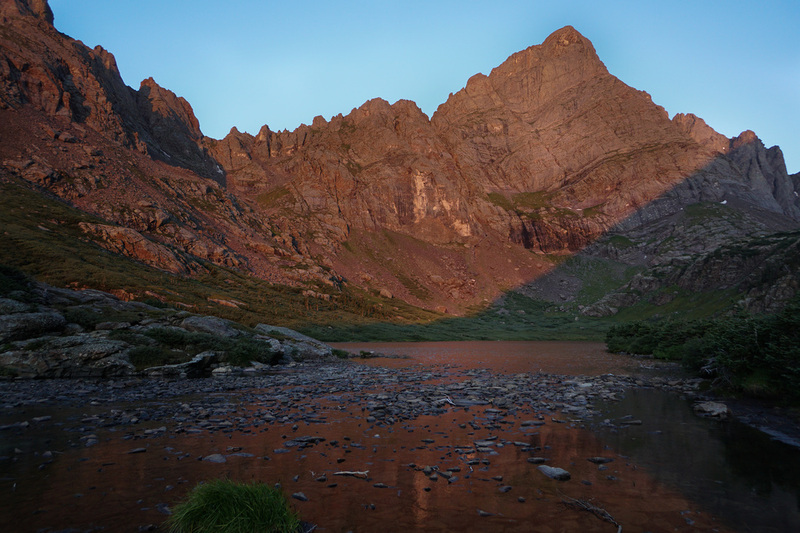 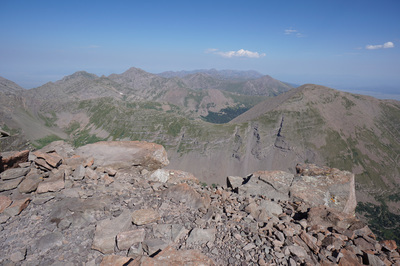 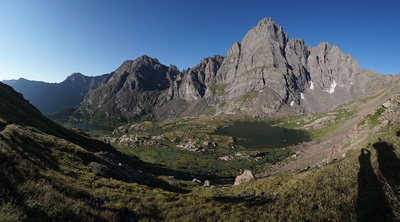 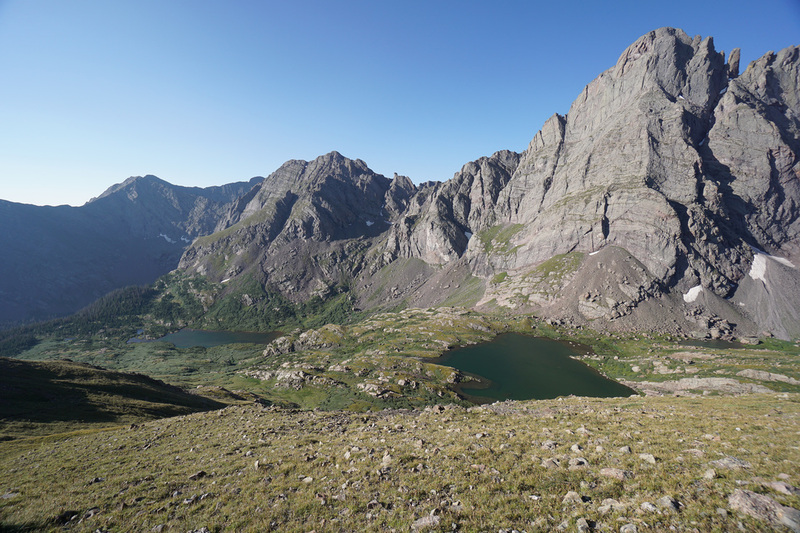 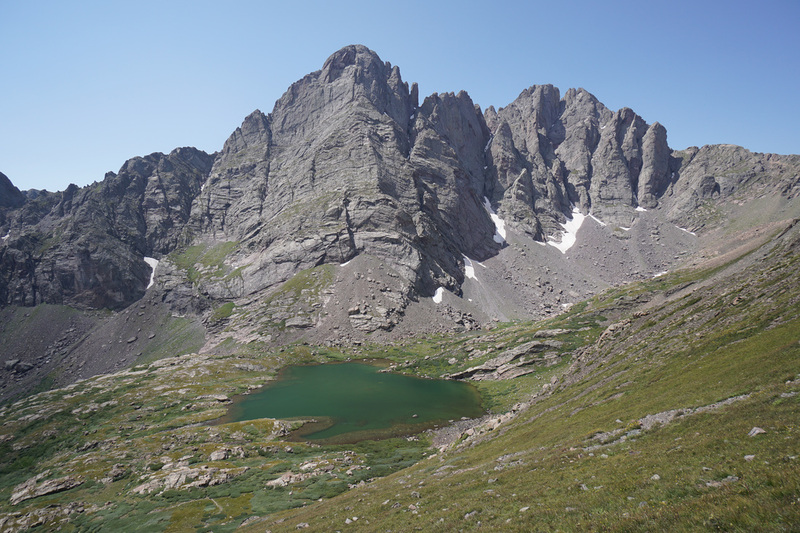 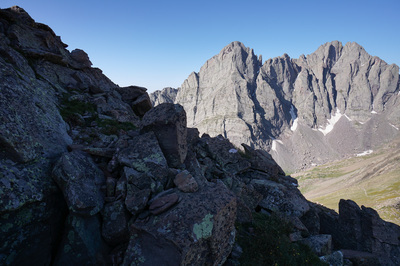 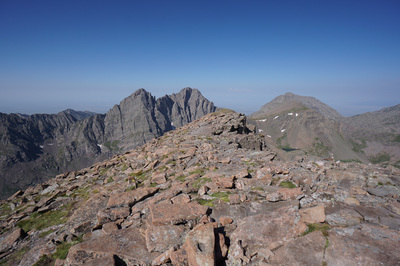 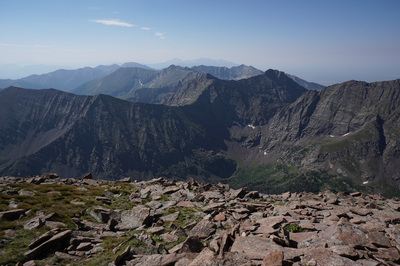 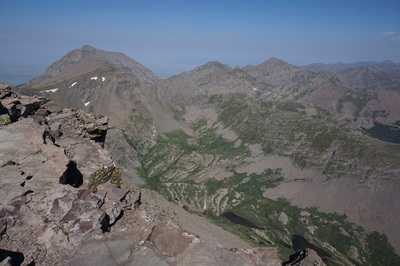 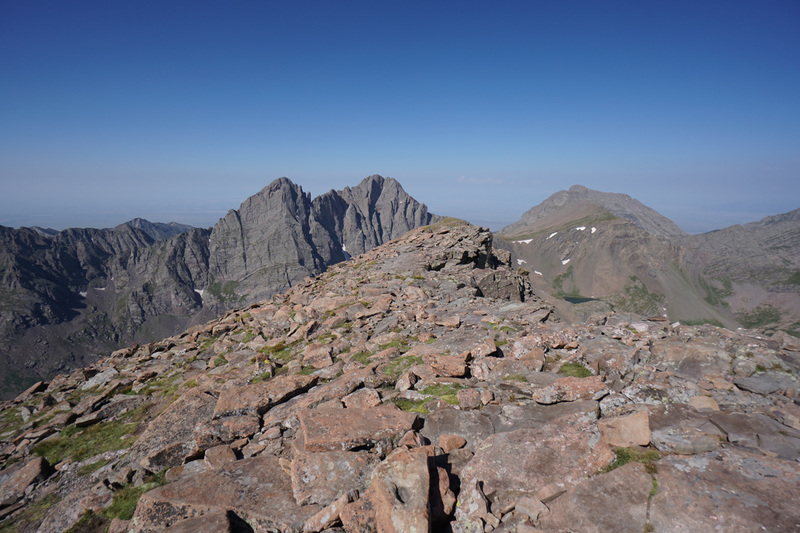 The best thing about climbing Humboldt is that you get eye level views of the surrounding 14ers, including Crestone Needle and Crestone Peak, which are some of the most stunning and iconic mountains in Colorado. 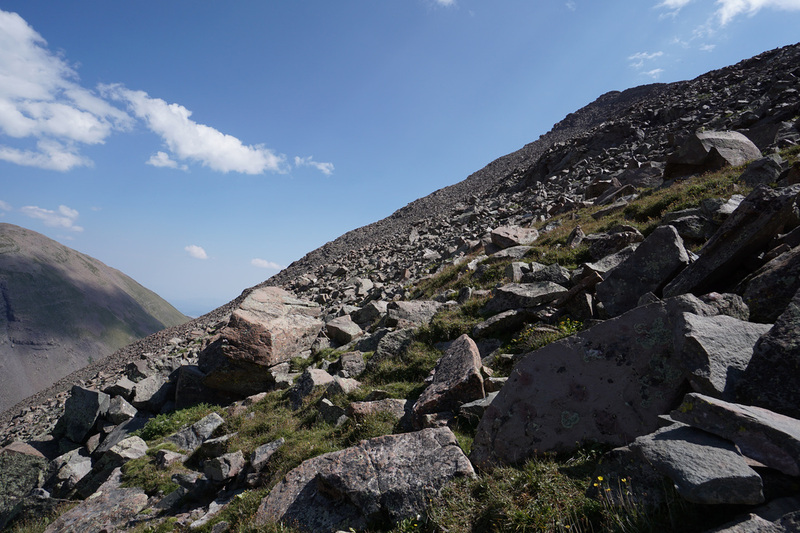 The approach is very straightforward. 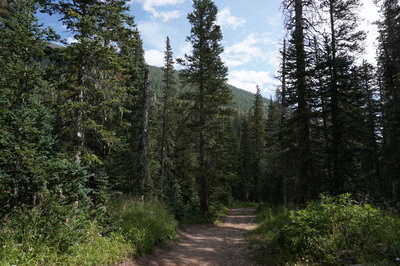 From the upper trailhead follow the wide dirt road for about 2.5 miles to the old trailhead and wilderness boundary. 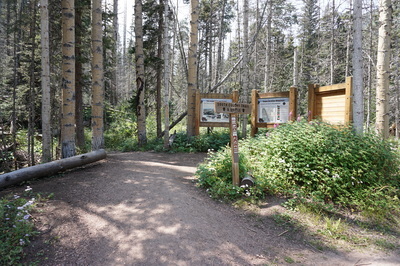 At the second set of trailhead signs you'll see a trail sign on the opposite side of the road. 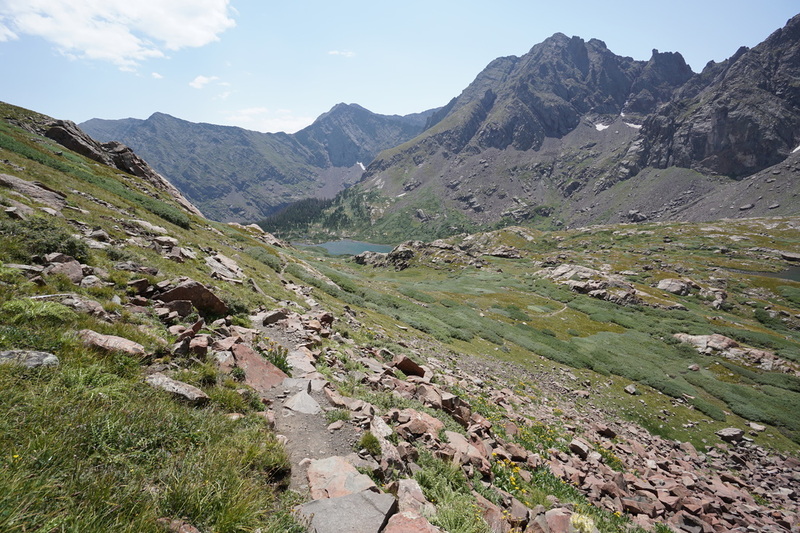 If you go straight here continuing to follow the road, you'll come out at the shores of the lower South Colony Lake. If you turn right at the sign and follow the single track, you'll reach an area of dispersed campsites above the lower lake. For hiking Humboldt peak, you'll want to turn right here. 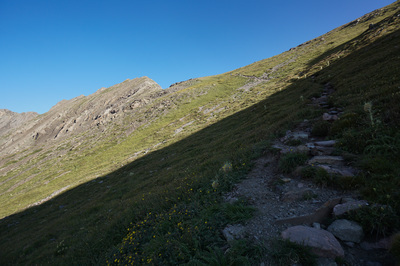 From the upper lake the trail switchbacks steadily up the saddle. 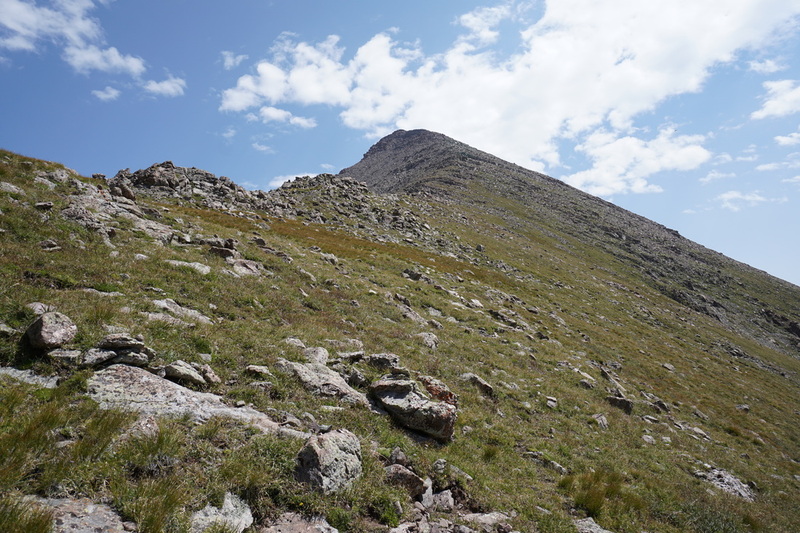 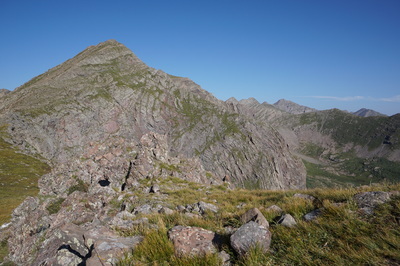 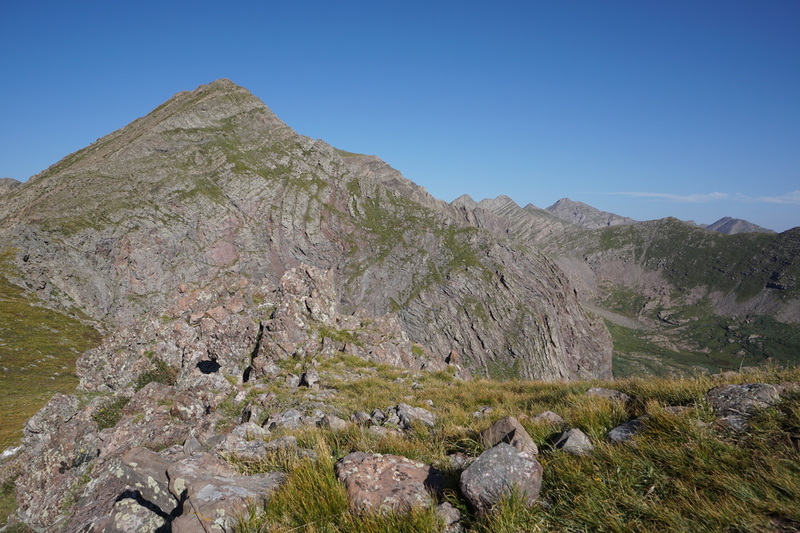 Although the trail is steep in some sections, the hike up to the saddle is excellent. From the saddle, the fun begins. 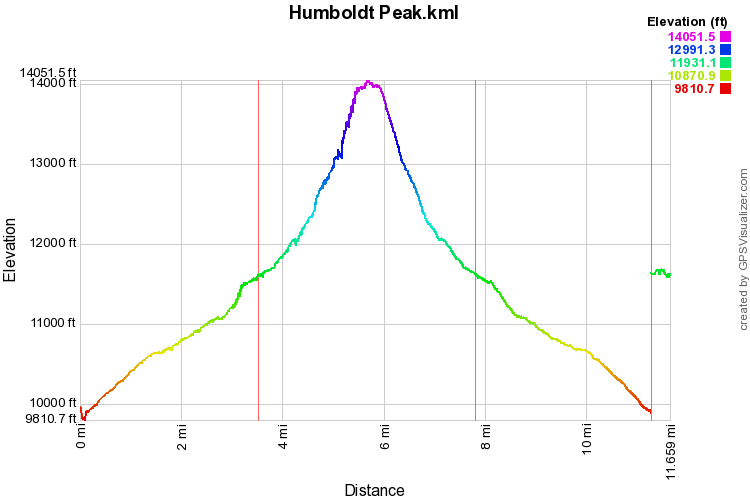 As you climb to the saddle, you'll get your first real views of Humboldt Peak. 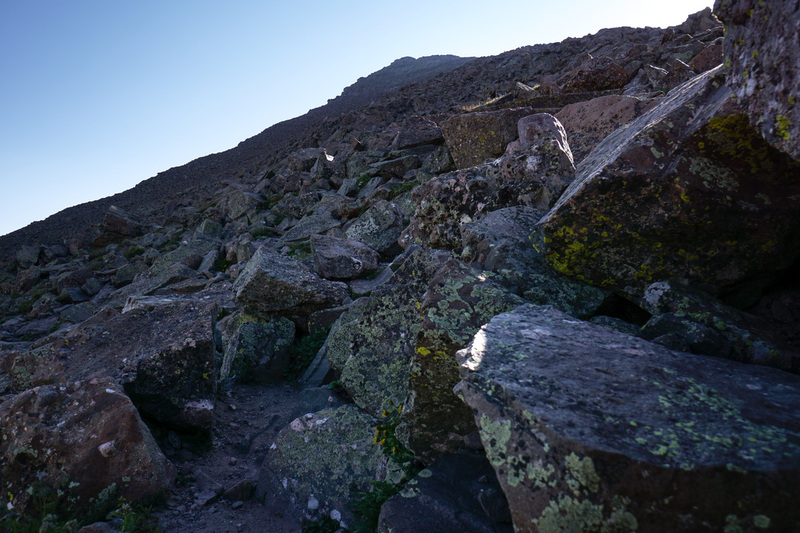 It is a very steep climb complete with boulder hopping and some easy scrambling. 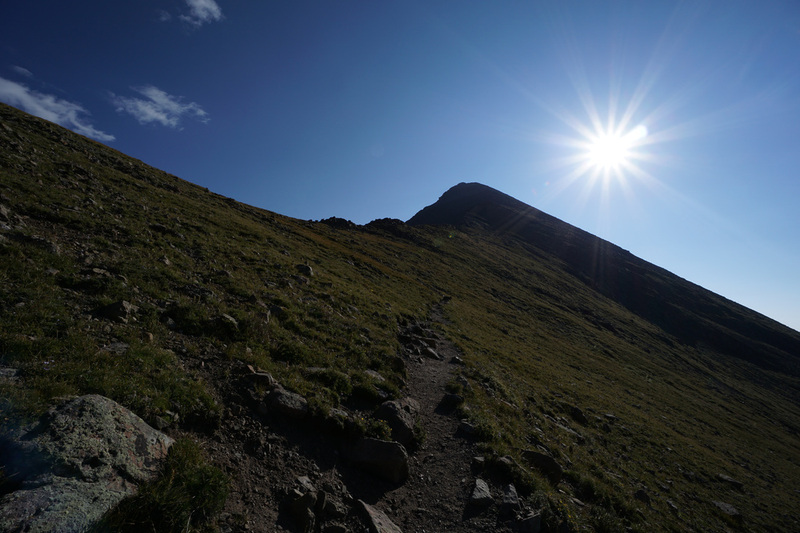 Just keep going, you'll make progress faster than you think. The important thing to keep in mind is that the actual trail is very hard to follow. Just keep on going up and look for cairns and dirt whereever you can find them. 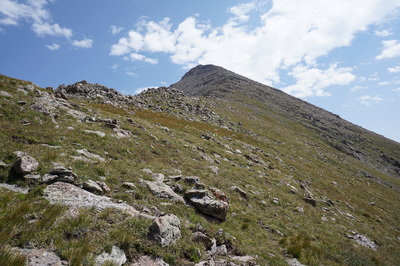 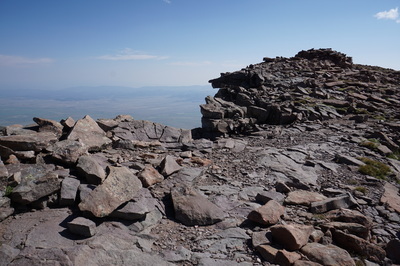 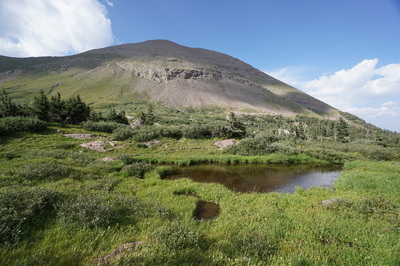 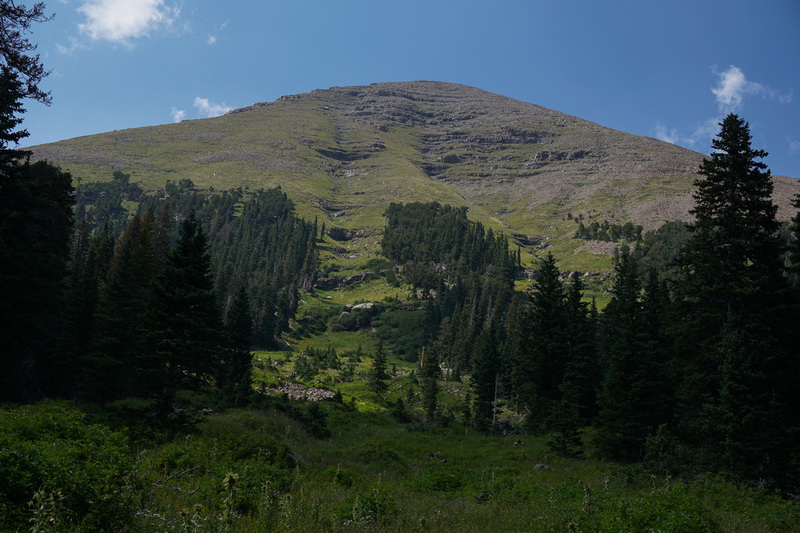 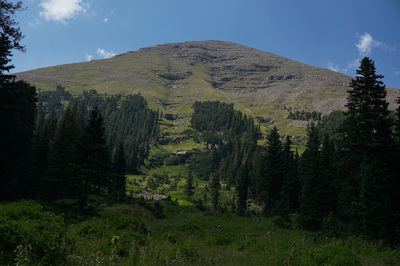 The first 2/3rds of the climb will keep you on the north side of the ridge, with amazing views of Colony Baldy and the twisted folds of the Sangres to the North.